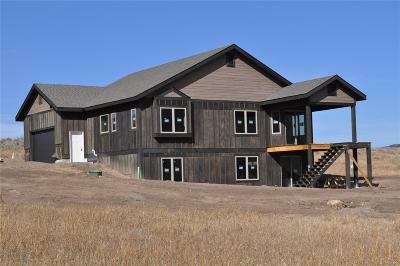 This new home is currently being built with completion expected by the end of April 2019. The finishes include board & batten fir siding with a stone wainscot, Alder doors and trim with granite counters, laminate wood floors in the main room, carpet in the bedrooms, and hand-troweled drywall. The garage doors are insulated steel and the roof is 30 year contour composite roof shingles. The high quality energy windows bring in an abundance of natural light with magnificent views. The main level features a covered deck for your evening meals with views of the surrounding mountains. The lot backs up to an open space providing a feeling of space and privacy. This home will have a large unfinished basement with a roughed out bathroom. The downstairs walk-out basement can be finished during the build for additional funds and could include up to two additional bedrooms and one bathroom as well as a large walk out family room. Get involved now and make custom changes to suit your taste.